The Galerie Thaddaeus Ropac is an art gallery in the Villa Kast right at the Mirabell Gardens with side-branches in the city centre of Paris (France) and a newly developing exhibition venue at the outskirts of Salzburg. Thaddaeus Ropac himself, born 1960 in Klagenfurt (Carinthia), is a highly regarded member of Salzburg′s art benefactor scene. He lives in Schloss Emslieb at the Hellbrunner Allee and is one of only a handful of significant galerists that Austria has to offer - probably the most important one. The Galerie Thaddaeus Ropac can be tracked back to small galleries that Ropac opened in Lienz (Eastern Tyrol) and later in Salzburg′s Old Town in the early 1980ies, after giving up his original idea to become an artist himself. From the beginning, his gallery was dedicated to highly regarded contemporary art. Which is unusual for Salzburg, a city with an "art scene" that normally concentrates on pimping out tacky Mozart-paintings and water colours with Old Town scenes to tourists. In an interview with the Austrian Press Agency APA, Ropac admitted that his beginnings at the Kaigasse were humble and shocked artists like Andy Warhol or Joseph Beuys when they came to visit him. Over the course of the years, the Galerie Thaddaeus Ropac became synonymous with all the good things that create fame on the art market: A good sense for serious works, access to important people on the art market and - maybe most importantly - for offering manifold opportunities for lucrative investments. Today, Thaddaeus Ropac is highly regarded in Salzburg, not only because his exhibitions add invaluable elements of contemporary art to Salzburg, but also because of his generous donations for the Museum der Moderne (Museum of Modern Art) and other art-related projects. A collection given to the Museum in 2009 was almost a million Euros worth - equalling the museum′s budgets for new acquisitions of about ten years. Ropac is involved with the Salzburg Association′s art project as well as with the Salzburg Festival and has close personal and professional links to Anselm Kiefer. 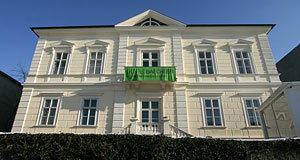 The Galerie Thaddaeus Ropac′s headquarter at the Villa Kast has the best exhibitions during the summer season, when the Salzburg Festival brings rich and famous folk to the city. Schloss Elmslieb is Ropac′s private home and not open to the public.